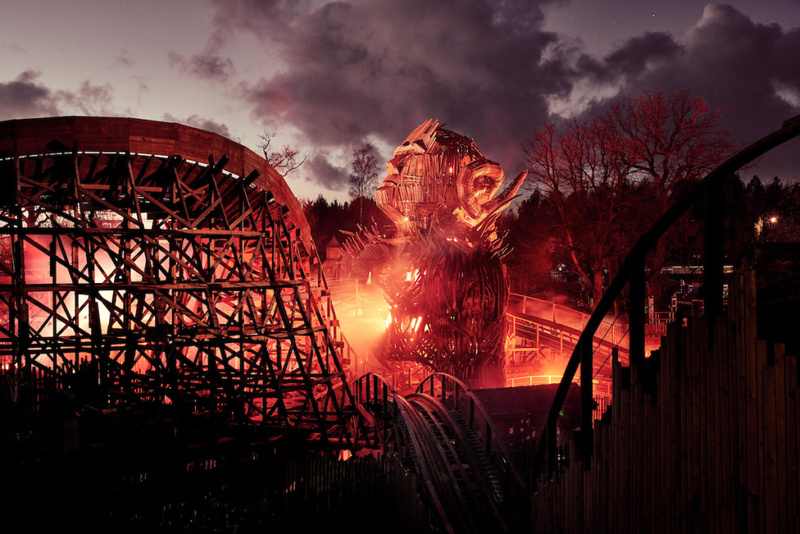 Dramatic New Wicker Man Images Revealed – TowersStreet - Your premier Alton Towers guide! 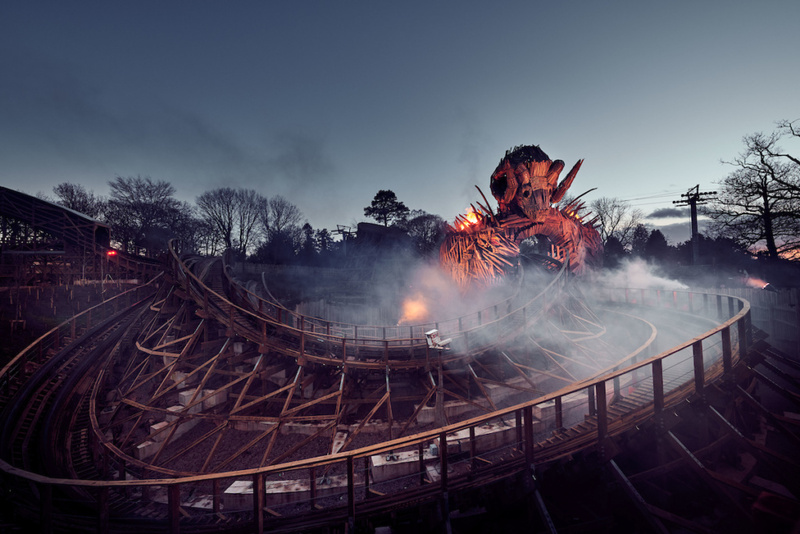 Alton Towers released a selection of brand new images for this year’s new attraction, Wicker Man. Taken in the dark, they offer the most detailed look yet of the ride and the giant 17.5m theming structure which towers over the area. 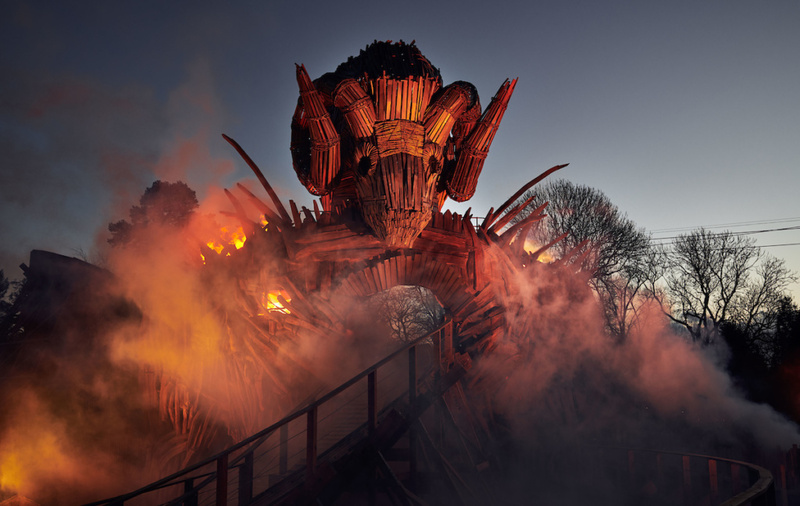 Featuring a human face on one side, and a ram’s head on the other, the much anticipated fire effects will add to the thrill as riders burst through the structure. As the images show, the ride should be especially spectacular during night riding at the resort’s annual Scarefest and Fireworks events. Guests choosing to ride Wicker Man will first take a journey into the world of the Beornen, the mysterious group living in the woods surrounding Alton Towers. Those brave enough will be ‘chosen’ to take part in a cinematic pre-show before heading onto the UK’s first wooden roller coaster in two decades. The resort are still yet to announce a solid opening date for the ride, only stating that it will open in Spring at present. Stick with TowersStreet as we bring you further updates and news as the 2018 season approaches!